The BMW X7 is arguably the most eagerly-anticipated vehicle currently being developed by the German carmaker and when it launches, is almost guaranteed to sell in considerable numbers. 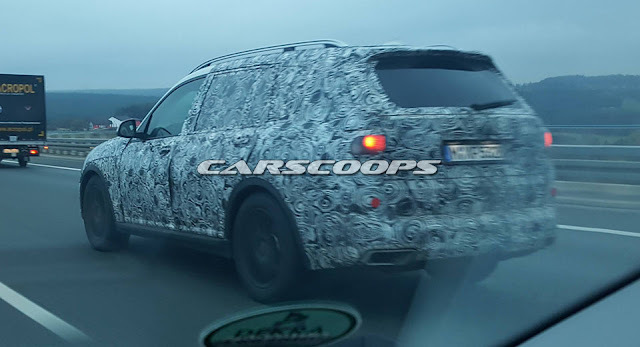 BMW has been testing X7 prototypes for well over a year and Carscoops reader Krystian Granatowski recently snapped some images of one on a highway near Munich. As with previous prototypes scooped testing in recent months, this example is bathed in white and black camouflage that hides most of its key design traits. In fact, all we can ascertain from the images is that the X7 will feature a huge kidney front grille, roof rails, black wheel arches, and large rectangular tailpipes. Beneath the skin, the X7 utilizes BMW’s CLAR platform, already in use with the latest-generation 5- and 7-Series. A host of petrol and diesel engines in six- and eight-cylinder configurations are widely expected, as is a plug-in hybrid with a four-cylinder. Much to the delight of President Donald Trump, BMW confirmed last year that the X7 will be built in Spartanburg, South Carolina. The SUV should hit the streets as a 2019MY. Compare BMW X7 With Jeep Wrangler.